I enjoy working with horses and people. It affords me the opportunity to constantly learn and improve my horsemanship skills and also grow as an individual. Horses are truly remarkable in the way they are and what they are capable of. 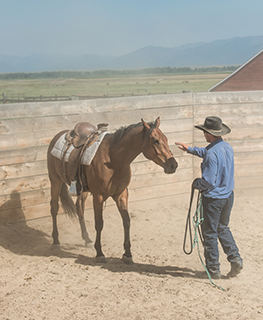 I’m trying to get these horses interested in what we are trying to do, and this is easier said than done because first we must understand what the horse needs. My goal is to have these horses soft, relaxed, and searching. I feel that if I can get these things working there isn’t much you can’t do with a horse. 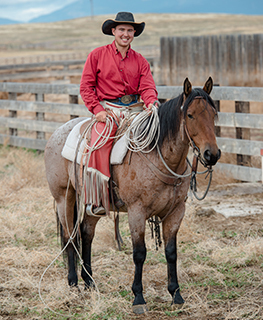 As far as my goals for the future, I will continue to see how good I can get at communicating my ideas to both people and horses of which I believe there is almost no limit. This idea I have of being as good as I can is very important for me. I feel that to be truly as good as possible at something, you have to explore yourself. You need to find the way you can do it best because no two people are exactly the same, so it would surely impede my success to try and mirror someone else and not use who I am to the best of my ability. With this said, it does not mean that I don’t look for people much wiser than me to help me along my path as I also plan on going to yearly clinics hosted by trainers such as Joe Wolter, Buck Brannaman, and Bryan Neubert. Truly, I’m after a lot more with horses than I can explain via written word and I would be more than happy to talk about it.